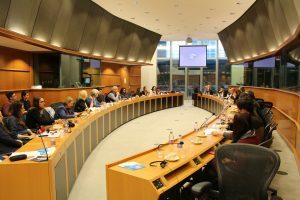 Within the framework of the Lifelong Learning Interest Group of the European Parliament, the Lifelong Learning Platform (LLLP) and the European Association of the Education of adults (EAEA) organised a seminar on “The role of education on promoting and strengthening citizen’s rights”. This event brought together civil society organisations of different interests and sectors, and the European institutions – represented by several MEPs and representative of the European Commission namely DG Education, Youth, Sport and Culture. The aim of the event was to understand how different stakeholders approach education as a main driving force to foster and promote citizens’ rights across Europe. Many EU citizens still face problems when exercising the rights derived from their status. Therefore, the event highlighted the need to continue our efforts to make sure that all EU citizens know their rights, and the mechanisms of their implementation, so that they can fully participate in the European democratic process. In the opening session MEP Krystyna Łybacka and Brikena Xhomaqi, Director of the LLLP, set the scene reminding participants how key education is in fostering democratic and civic participation at all levels as well as in promoting shared values on a daily basis. However, this requires the use of methodologies that involve learners actively in their own learning creating a space for practicing democracy at all learning environments. Subsequently, MEP Svetoslav Hristov Malinov highlighted that nowadays younger generations do not know their rights and take them for granted, which is a litmus test to understand how far Europe has gone. Marta Markowska from the European Commission outlined the main initiatives of DG EAC to strengthen citizens’ rights, and presented the preliminary results of the EU Public consultation on the “Recommendation on Promoting social inclusion and shared values through formal and non-formal learning” which showed that most of respondents think education should do more. Many questions were asked on the different tools that were put forward, as the discussion moved to more substantial matters. Participants in this panel – Assya Kavrakova from the European Citizens, Gina Ebner from the EAEA – highlighted the importance of the education and involvement of adults in order to shape communities at the local level. In particular, a lot of emphasis was given to the Erasmus+ Programme, as one of the flagship programmes of the European Union and the only one that supports and promotes shared values through formal, non-formal and informal learning. MEP María Teresa Giménez Barbat concluded the panel discussion stressing that today EU citizens are aware of their rights: what is lacking is a robust supervision on the implementation level. The second panel brought to the debate the perspective of students – with the presentation by AEGEE – and the non-formal sector – with EUNET. MEP Lidiah Nì Riada drew attention to the fact that education not only fosters citizens’ rights, but also promotes the democratisation of our societies, as it forms the generations of tomorrow informed with today’s values. Hence, the importance of empowering teachers and trainers to help them deliver the best education. As Thomas Heckeberg from EUNET stated, teachers are fundamental actors in that they should not only teach learners about their rights, but also how Europe got to design those rights as the basis for its society. This is why civil society is asking for a structural reinforcement of the Europe for Citizens programme: with an increase of only one euro per citizen, many of the target goals can become a reality. Using role models from Sport and Cultural sector was also mentioned as a good practice to motivate citizens to become active. MEP Krystyna Łybacka concluded the seminar by expressing her desire to see “ambassadors” of citizenship, such as sportsmen and sportswomen around the globe: younger generations look up to their idols, and follow their role model. Overall, the seminar was a fruitful occasion to bring together key actors in both the education and the citizenship sectors. A complete report of the event will be made available in the coming days. To learn more about the Lifelong Learning Interest Group, please contact the Lifelong Learning Platform.